0.0.1 The different types of Bedroom Dressing Tables vary in style, shape, color and material. The different types of Bedroom Dressing Tables vary in style, shape, color and material. Whereas many modern dressing table designs have straight lines and a plain look, Victorian styles may be extremely detailed and ornate. Dressing tables are often either rectangular or kidney-shaped. Bedroom Dressing Tables are available in dark or light colors in materials that include hardwood, plastic, faux wood, laminate and even mirror tile. A bedroom dressing table with its entire surface covered in mirrors tends to reflect the other furniture and accent pieces in the room. 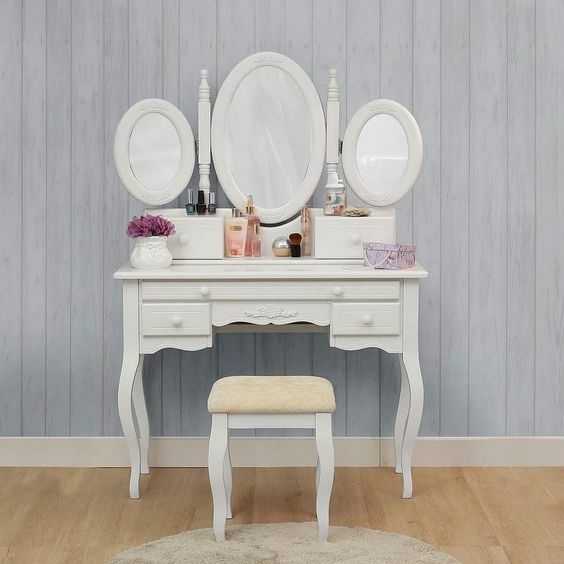 This kind of vanity table has a glamorous style that also has the advantage of blending in well with practically any color of bedroom furniture. While some mirrored dressing tables for bedrooms have mainly a straight-lined structure, others are curved in their design. Laminate or faux wood dressing tables for bedrooms can be an economical choice. While faux wood tables usually feature a grained texture to look like hardwood, laminate varieties tend to be smooth. Laminate bedroom vanities may be in white, black or another neutral color. Both laminate and faux wood dressing tables are often straight-lined in design and may feature drawers on either side of the center area. Plastic is typically the least expensive type of vanity table, but it’s usually only made for children. This type of bedroom dressing table is often in a vivid color combination such as pink and green. The table is child height and the matching stool or seat may feature a storage compartment. Hardwood Bedroom Dressing Tables are usually the most elegant as well as expensive kind. Oak, maple, cherry or other popular hardwoods are often used for this type of bedroom dressing table. Traditional styles may feature brass drawer pulls, while more modern styles could have silver-toned cupboard handles or knobs. The seats sold with hardwood dressing tables may be elegantly padded for comfort. Kidney shaped dressing tables for bedrooms may be in many styles, but they are often seen in more romantic designs. These bedroom dressing tables may feature floral printed skirts that fit around the edge of the table and hang down in a gathered fashion right to the floor. The tables are often either dark or white-painted wood. If a romantic or Victorian type of bedroom dressing table is rectangular instead of curved in design, it’s likely to feature an oval or round center mirror.